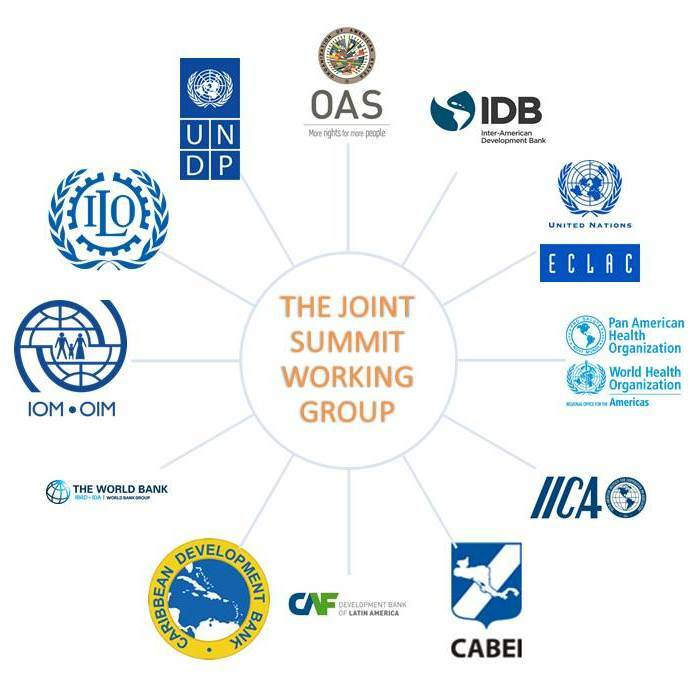 The Joint Summit Working Group (JSWG) coordinates the support of twelve Inter-American and international institutions to the Summits process. These institutions provide technical guidance to countries in the identification and negotiation of issues addressed in the Summits process. The JSWG also plans and carries out projects and initiatives to implement Summit commitments and supports inter-American ministerial meetings and their linkages to the Summits process. Additionally, the group participates in Summit policy dialogues to exchange ideas regarding policy approaches for the Summits process. The OAS Summits of the Americas Secretariat serves as Chair of the JSWG. During the Third Summit of the Americas, held in Quebec City, Canada, in 2001, the partner institutions of the Summit Process the Economic Commission for Latin America (ECLAC), the Inter-American Development Bank (IDB), the Pan American Health Organization (PAHO), and the World Bank), coordinated by the Organization of American States (OAS), presented their first joint hemispheric report, outlining the activities carried out in fulfillment of the mandates of the Second Summit of the Americas, held in Santiago, Chile, in 1998. As a result of the Third Summit of the Americas, the role of these institutions became more prominent: The Quebec City Plan of Action underscored the need for permanent coordination in the inter-American system and welcomed the involvement of international organizations in all stages of the Summit Process. Report on the initiatives being carried out by the institutions of the Joint Summit Working Group (JSWG) in support of the management and implementation of the mandates agreed in the framework of the VII Summit.